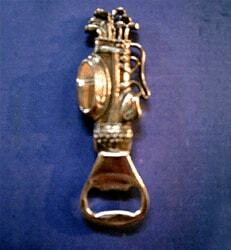 Another bottle opener for the golfers bar! 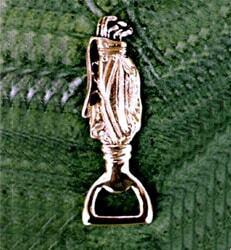 The golf bag is a faithful reproduction of the real thing. A charming piece. If the many golf bags seen in a golf course possess their own unique appearance and character, so do our bottle openers! 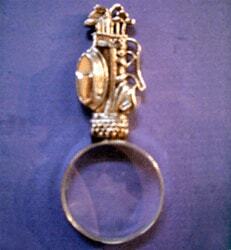 Here is another well made and slickly finished piece. 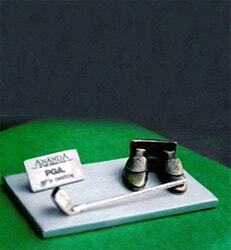 The finely detailed golf shoes work as a perfect holder of business cards on your work table. Small plate allows high visibility branding. Convenient and smart, it is sure to catch the attention of your important business visitors. A caddy to hold your small envelope opener. 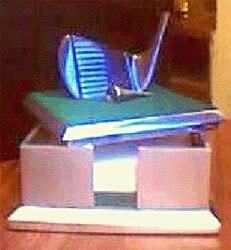 The driver in front adds to charm of this smart table-top product. 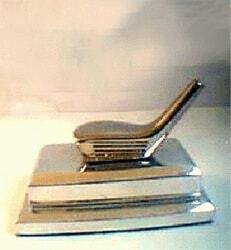 In its satin aluminum finish the caddy contrasts beautifully with the light antique nickel golf bag handle on top. 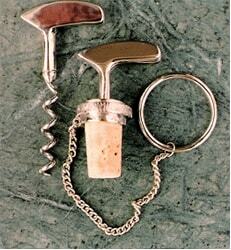 Putter Cork Screw and Wine Stopper Set. 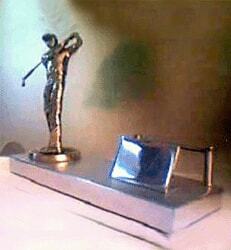 Delightful accessories for a golfer s drinks bar. The finely detailed design of a golf iron acts as a great swivel stick to stir up exotic cocktails at the golfer s drinks bar. 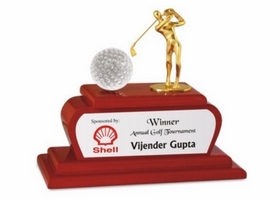 The round disc on top can be branded with your logo or inscription. Finished in high gloss chrome that will not tarnish. Another smart box of 3 square for your memos. 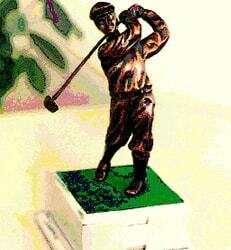 This time a beautifully crafted young golfer in vintage clothing is seen completing his drive. A smooth bronze finish on square green makes it a piece of great character. 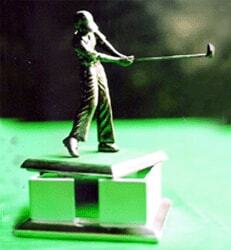 Finely sculpted 5 Iron head with a tee on soft green felt will urge a true golfer to rush to the links! 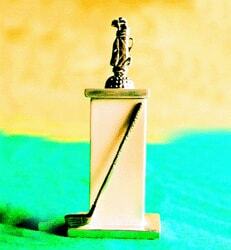 A neat memo box for the golf lover. Memo size approximately 3 square. 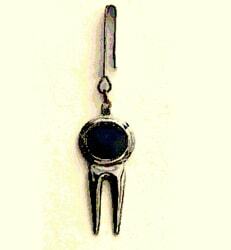 Another neat design that will appeal to the sophisticated golfer. 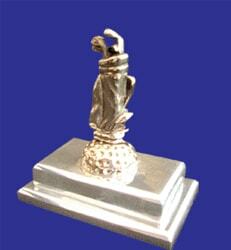 Will stand out quietly on an executive desk. 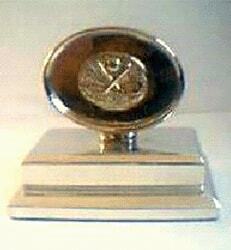 Small logo or inscription in fine print is possible on the polished glossy aluminum base. 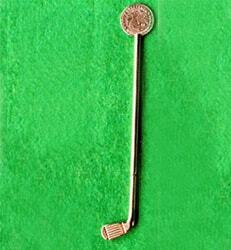 Divot repair tool that can be hooked onto a trouser belt and with a magnetically attached stainless steel ball marker. 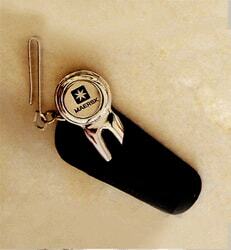 Ball marker can be customized with your logo or inscription. Similar to the Model GCH-059 on the previous plate but without the pen/pencil caddy. A smart box to keep your memo pad clean and tidy.Pad size approximately 3 square. The aluminum memo box is hand finished in smooth satin with glossy accents. 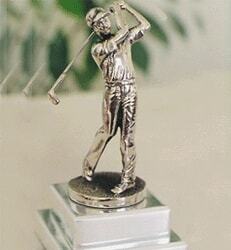 The acrylic caddy will hold two golf balls. 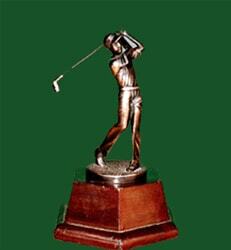 The lid, with the young golfer in vintage clothes, and the base is of polished aluminum that will resist tarnish for a very long period. 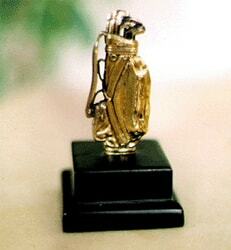 A wonderful gift for an avid golfer. 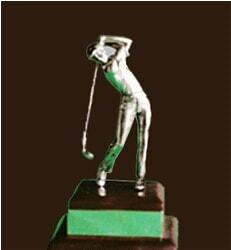 Young golfer in bronze finish executing a nice long drive and atop a polished hexagonal wood base. Beautifully detailed. The polished wood base can be branded.